What a great place! There's nothing else like Adventure Denali anywhere in Alaska. These incredible rainbow trout, were stocked in Chevy Lake near Cantwell, many years ago, and, with supplemental feeding, limited fishing opportunities, and strict adherence to catch and release policies, they've now become huge! 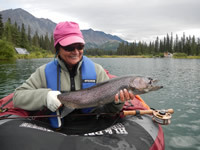 Kirk Martakis, the owner of Adventure Denali manages the place with a fish-first philosophy and overseas every part of the operation. 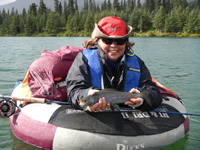 A truly unique place, Adventure Denali, the only "pay to fish" operation in the State, has developed a fishery where you can pursue rainbows over 30- inches long as well as large, native grayling, that have flourished because of the feeding program for the rainbows. 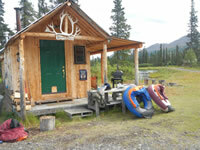 Tourists staying in either Kirk's cabins or in one or the other lodges on the way to Denali National Park are the typical users of the lake. 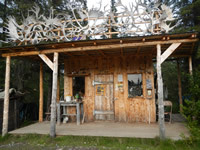 This report is from our second trip this year to enjoy the fun. We arrived in the rain and departed in the rain, and had rain every day except one, but we bundled up and took off in the tubes nevertheless. Neither Deb nor Stephanie had ever float tubed before, but they quickly mastered the basics of getting in and out of the tube, managing the flippers, and paddling to move around the lake. They lost some big fish because they didn't set the hook, and because they were so startled by the take that they forgot to paddle away from the fish to keep it tight, but, it wasn't long until their rods were bent, and they were ready to learn how to release and revive a fish from a float tube. 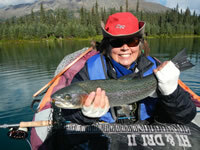 Deb caught a fish in the 28-inch range, and after a good fight, was really pleased with her success. She quickly got the technique of holding the fish and making the tube go around in circles to enable the fish to re-oxygenate. Some of the other fish were large, some were medium-sized, and some were around 12-14 inches. The water was so clear that we could look down and see many sizes of fish with our Polarized glasses. The really large fish looked like dark torpedoes as they followed us around the lake. We couldn't decide if they thought we were going to feed them, or if they were in love with our flippers. Still, they weren't easy to catch. We used several different streamers, some black, some olive, some red (which was really successful in our June trip), and some purple, but it wasn't until we tried orange that they really got interested and we had more hits. Some of the fish were Arctic grayling, which were already in the lake in the beginning, and we had fun with them as well. It was amazing what large flies they would take! They also enjoyed our nymphs. The weather wasn't really very conducive to dry fly fishing, unfortunately. Our third day we headed east up the Denali Hiway to visit Brushkana Creek. Along the way we followed a lone caribou trotting along the road all by himself, apparently trying to find his herd. He'd stop every few minutes to sniff the breeze, and finally turned into the alders and disappeared. We'd hoped to do some dry fly fishing at Brushkana, but just a few of the fish there were interested. 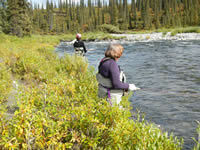 The water was absolutely raging from all the recent rain, so it wasn't easy fishing, even in any of my hot-spots. Nymphs, however, were a little better if we could get them into just the right water, and we also finished the day with some fun fishing with the small streamers. As we headed back to the cabin, the afternoon light was absolutely brilliant on the yellowing aspen and the blueberry bushes, loaded with berries, were all turning red. The hills were absolutely glowing, since we finally had some sun, and the scenery was extraordinary. It rained all that night, though, and our last day was cold and still rainy. We tubed for awhile, but then decided to take our rods and hike around the second lake on the property to try fishing from the bank. We caught several smaller fish, and we could only get the large fish interested in examining our flies, but not taking them. With just a couple of hours left to fish, we put on more clothes and got back into the tubes. Boy it was cold! The wind was really blowing by now but, for some reason, the fish started biting like crazy. Deb had six fish on one right after the other, using a very small, black streamer, and Stephanie and I fished Czech-nymphs with great success, as well. Finally, we were just too cold to stay out there, and we headed back to the cabin for a warm fire, a glass of wine, and some hamburgers to put on the bar-b-q. It was the perfect ending to a great day. Yes, we're definitely going back next year - twice if at all possible - so we're just waiting for you to tell us you want to go along.